My least favorite step of quilting is the sandwiching. And yes, I've tried the spray (too messy) and the fusible (too fussy). The pins work best for me, but oh my aching back! I still have to do big ones on the carpet and I'm getting too old for that. I really must research a good table to buy. Where did you get yours? Despite all my groaning, I did manage to cut 6 battings for some tops and sandwiched WIP #1. I used all of a roll for a king size quilt - 120 x120 for those six. So glad the WTBQ pile came down. 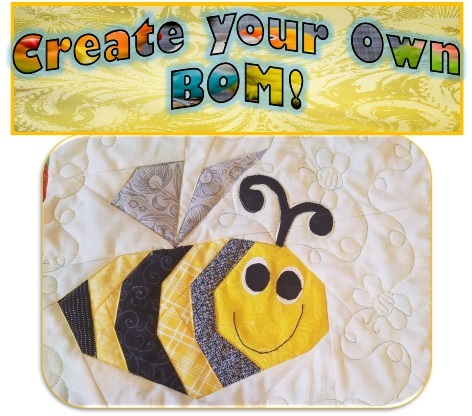 My Two BOMs in One is ready to be quilted. I'll start on that tomorrow morning. And I picked out the next two wips I'll be working on. I'm going to make a pillow cover out of that crane block (#4). The appliqued blocks (#5) are ready to be put together with sashing for my July wall hanging. And I finished another hexagon flower for WIP#3. Phew! How are you doing on your WIP? Would love to see - doesn't have to be a finish, but we'll admire those, too. Linky below - remember it doesn't have to be a new post, just one that shows your WIP. Ends Monday, midnight. Since I finished a flower I'm linking to Amanda's Finish it Friday and Sarah's Can I get a Whoop, Whoop? Lots of eye candy there. if my big hand quilting frame is set up with a quilt on it in the process of hand quilting then I too use the floor to pin baste - sometimes if the big frame is empty I will pin baste on the frame - one day i will need a new solution as well. My first experience, about 10 yrs ago, I was pin basting on the floor and my cat totally destroyed what progressed I made. So I purchased a sheet of plywood,covered it with contact paper and it sits on top of a card table. Very portable and the whole backing can be clamped down for a "no wrinkle" backing. 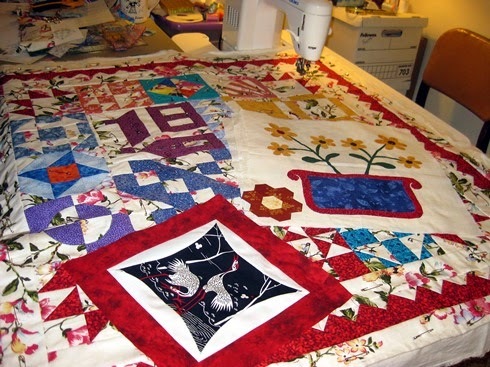 Easy to pin, I no longer will baste quilts for hand quilting. I admire all your work. I haven't been in my sewing room in days. I pin on the floor like you as I just don't have room for a large table to pin on. 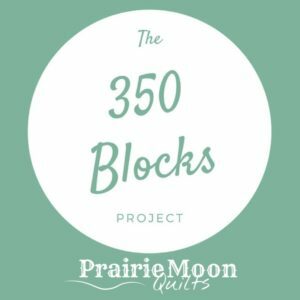 Congrats on making such great progress on your quilts! I think the crane block will make a lovely pillow, for sure. I was cycling along the Boise River the other day and saw a crane hidden in the side bushes along the river. So cool to see. I have a cutting table that I use for lap size quilts and at my Mom's we have two folding tables that are about 3" x 6". They have plywood tops that we covered with vinyl. They are great because it is a nice large surface for pin basting. My days of pin basting on the floor are long gone! Sometimes libraries, community centres and quilt shops have large tables and they will let you come in to pin baste quilts. I still crawl around on the floor and pin baste and get an aching back. It's been a week of little stitching for me, so I have nothing to post. =P However, I love the two blocks on top of your finished quilt! Sounds like you have a good plan for moving forward plus got lots done in the last week. Thanks for the invite to link up! I am happy to join. I still hand baste - ugh! Worst part of the quilting process, I agree. Love to see what you are doing. I can understand your frustration with getting the quilt all together....my empty nest gift was finally a long arm...for a variety of reasons...but I DO LOVE it! I use my dining room table for pin basting my quilts. It works great if I put both leafs. I agree getting down on the floor is getting harder. Thanks for linking up with Pink Doxies this weekend. It's so nice meeting up with so many talented quilters! Tables: I love the 6ft long Lifetime tables, but they're too short for any real work--especially pinning where you're stooped over! Then buy bed risers available online, Walmart, etc. I opt for 7" high for my primary work space, 5" for another, and also one at 4". They will save your achin' back!